I have been intending to go to El Jem for quite some time but being up in Bizerte it was always a bit far away for a day trip, so I was very happy when the wife agreed to make the significant detour on the way back from Mahdia so that we could visit. El Jem is probably the last place you would expect someone to build a wonder of the ancient world. Although the area is nice, it is surrounded by miles of olive trees and the odd settlement consisting of a few houses, bored old men and the occasional wandering dog. When you finally get to El Jem – BAM what a whopper! 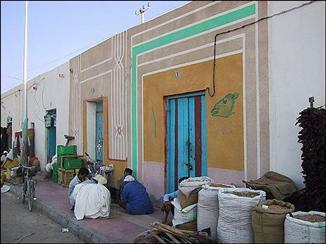 The building dominates the small town. It seems that all roads lead to the amphitheater thus it is very, very easy to find. There are two car parks situated at the front of the amphitheater and for early January there was a healthy number of tours, cars and 4x4s so one can assume that this attraction can be pretty busy in peak season. Once parked, we made the short walk around the Amphitheater. The building is fenced off with just one entrance. The fastest way to reach it is around the front and I have marked this on a map below. If you walk around the back, as I did, you find yourself walking the long way around a row of shops. Once you reach the entrance you have to go down a number of steps to enter the base of the amphitheater. If you are disabled or have a baby (as we did at the time) please be very careful since you are expected to roll down a steep 25 meter slope (with a 30 degree+ incline) to the bottom, which is pretty perilous. This slope is also very thin with steps on the side, so potentially if you are an independent wheelchair user, please get someone to walk you down as you could kill yourself. This also applies to visitors with kids in prams – be very careful. Once you reach the bottom there is a booth where at the time of writing you were expected to pay 8 dinars each (expensive for average Tunisians). 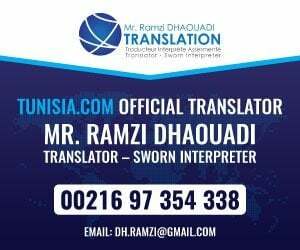 However if you are an expat Tunisian living abroad you get free entry. Once this is paid you simply go through and enter the amphitheater itself. On the inside I paid 3 dinars for the electronic guide which was quite good Having visited the Colosseum in Rome I can say that this amphitheater, although smaller, is just as impressive and having the ability to walk around the centre is excellent as it gives you the feeling of what being a gladiator was all about. You can just imagine the lions or chariots careering around this massive arena. Even with a pram I was able to walk around the centre although other parts of the building are strictly for able-bodied people. Once again I noticed how dangerous it was for small kids since the building was not designed for children running about. In its heyday the building would have hosted games for 25-35,000 spectators which even these days would have made it one of the largest stadiums in Tunisia. As you walk around the building you can see the town outside and it always nags you: why did they build this here? Historians also puzzle over why this huge amphitheater was built so close to the one at nearby Bir-ez-Zit. There are only two monuments in the world today that are larger than El Jem. One is obviously the Colosseum in Rome and the other is Capua which is near Naples and is actually in worse condition. Both were built in the Roman heartlands in modern day Italy. 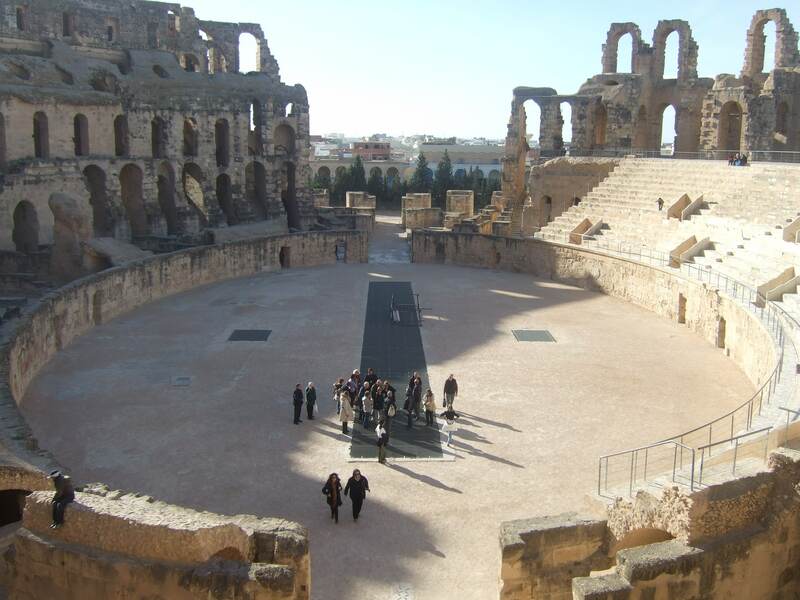 What you have in El Jem is the largest stadium of the ancient world outside Rome’s immediate vicinity. Considering the massive investment required to build such a facility as a measuring stick you can only surmise that El Jem or Thapsus (its ancient name) was either extremely important, extremely wealthy or indeed both. If we go back a good two thousand years to the time of the Carthage Empire, a time when Rome (Italy) and Carthage (Tunisia) were the US and Russia of their day, Tunisia was a very different place than it is today. Thapsus/El Jem did not even have the same climate. It was in fact a lot less arid and more fruitful. Back in those days, Thapsus was an influential place since it was the central trading post of the olive oil trade, closer to the sea than it is now and independent from Rome and Carthage. This independence gave Thapsus a lot of leverage in those days of war; it meant that by siding with Rome against its neighbour Carthage it stood to gain “free city” status. 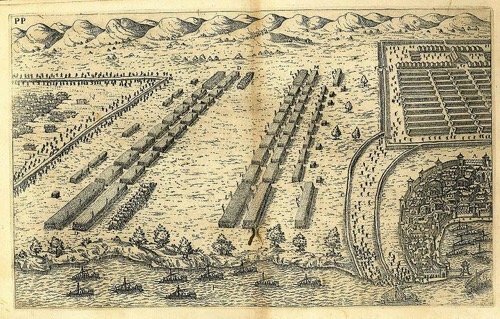 This status meant that Thapsus was the Dubai of its day, centrally located, with low taxes and it was an important trading post for olive oil, an extremely valuable commodity at that time. The building itself was commissioned apparently around AD230, a few hundred years after the famous battle of Thapsus where Julius Caesar fought for control of the Roman Empire in 46 BC. The man credited with starting the project is Proconsul Gordian, a man with a lot of money and land as well as big ideas. He later committed suicide in the building when his rebellion against Emperor Maximus (incidentally the only Emperor who was formerly a soldier and the inspiration for the film “Gladiator”) did not go as planned. So what you have in El Jem is both a structure for entertainment and one of politics, with a capacity far in excess of the town. It served as a regional facility where its size served a number of civic, sporting and judicial functions. The arena itself was a cross section of the society of the time with the most important seating by the “stage” and the lower classes up in the gods, in the same manner as in the Colosseum in Rome. Similar to the practice in Rome, spectators would be issued with a ceramic token which would act both as payment and also show to them the entry point and passage/vomitoria they would need to access. Such passages show a high degree of sophistication in the planning, meaning that the stadium could be filled and emptied at great speed. In fact, in latin “vomitoria” is a passage where someone can get out of quickly and, you guessed it, it is the mother word of vomit in the English language. Walking around the arena you really do feel the atmosphere. If you look closely, you can see some inscriptions from tourists who, over the centuries, have been here before you. Originally the arena would have been covered in logistical information, very much as a stadium is today. El Jem is a wonderful place to explore. Not only can you walk in the upper reaches, you can also sit in the VIP section of seats that have been restored, and then walk around the massive “playing surface”. Standing in the middle of the arena floor can be exciting and sobering for those of us with a vivid imagination. It is certain that hundreds, if not thousands, of people and animals died here in the name of entertainment. We may nowadays feel that we are more civilised, but its not a million miles away from an intense football match or indeed a bullfight. This was the Wembley, the Madison Square Garden and the Court of Justice, all in one place. 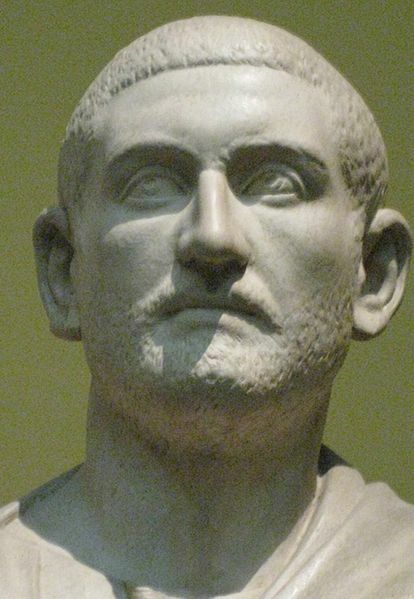 Gordian, like other political leaders, knew that people loved games and spectacle. In the amphitheater’s heyday, the leader needed to be part administrator, part Don King. You can see the money that was lavished upon building it. Even the walls in the centre of the area were marble clad. 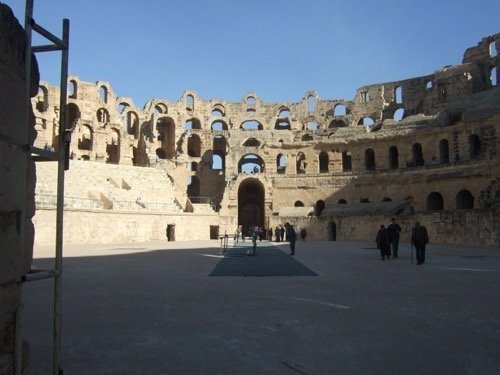 At floor level there is a pair of doors where, like in the film “Gladiator”, men and animals would enter the arena. Sometimes an ejecting mechanism was used when men would jump up in a lift that would pop open the trapdoors. When you consider the age of the structure, it is in amazing condition*. It might still have been whole today if it were not for a struggle between the Turks and the ruler, Mohammed Bey, when some of the walls were blown up with a cannon to flush out the rebels hiding inside the amphitheater. Some of the stone was then looted and used to build local homes and even the Grand Mosque in Kairouan. This was certainly a quality structure, built to endure. * it is also obvious that much of the structure was added to and renovated over the years. El Jem is a must-see. If you have not been to Rome then you will be amazed to see this wonder of the ancient world. It is definitely worth adding to a tour. If you are visiting Sousse or Mahdia, renting a car is car easy, or club together and get a taxi/mini-bus to get here. El Jem is well connected by road so you do not need a 4×4 to visit. You can hire a car for the day from Sousse or Mahdia, which are both about an hour away. El Jem is well signposted from the motorway too. Make sure you bring some water and a hat as El Jem can get hot and the building is pretty open. Also, since the area is flat, it can get pretty cold at times, so bring a jumper too!